Spurred on by yet another weekend of issues with the plumbing in my flat and a forecast of sunshine, the bike touring and camping trip got the go ahead and I began to pack. This would be the first time I had been camping since I was about 18, now over 20 years later, possibly in the middle of some sort of crazy mid-life crisis and deep desires for adventure in my life, in possession of a bike, a tent and most of the basics, that was it, I was going! The pipeline idea I had been harbouring and subsequent accumulation of camping bits and bobs I had managed to acquire on a tight budget were going to be put into use at last. Checking off the list, a pile of organised essentials was gradually packed on the back of my bike, the route was planned, tyres pumped up, chain greased, bike checked, weather checked, everything charged, right, pretty much good to go. Was too excited to really get a good sleep as well as anxious not to miss my alarm or something and be late for the early ferry I had to board at Adrossan. Made it in plenty of time with a few hours sleep, got to the ferry port at Ardrossan and joined the end of a huge queue of other cyclists all eagerly waiting to board. Still excited, all this was a new experience for me and the bike, the biggest challenge we had set ourselves yet and with a load of extra weight to deal with too. We were the last on the ferry, welcomed by some friendly deck hands and shown a space where the bike could be parked on the lower cargo deck, meanwhile I went upstairs to see the views as we crossed over to the Isle of Arran. The short hour or so hop across passed quickly and the keen weekend racing cyclists all sped off into the distance, meanwhile me and my old retro classic road bike toddled off and began our journey. Initially the plan was to cycle clockwise, landing first at the Seal Shore Campsite where I could then set up my accommodation for the night and relieve my bike of the extra weight before cycling the 60 or so miles round the island. However, I changed my mind last minute and opted to go anti-clockwise, cycle 48 miles get to the campsite and then do the last leg the next day returning me to the ferry port to come home, as it made more sense. So, we were off, me and the bike that is, the sun was shining, the views stunning and I had my favourite tunes for company playing on my attached Bluetooth speaker! Surprisingly, all the extra weight on the bike felt relatively unnoticeable, much less of a hindrance than I had thought. On the approach to Lochranza we reached a challenging hill climb or two, to say the least! Had to get off and walk the last few meters to the peaks of them or risk just falling over off balance! Lol! Once over that section to the western side of the island though it was more pure pleasure riding along the coast with sparkling clear blue water and a gentle sea breeze. Bliss. Stopping off to take photos, eat snacks and taking in the scenery, no rush, as long as we got to the campsite at a reasonable time it was all good. No more huge hills after that really, just some easier climbs on the approach to Kildonan where the campsite was tucked away down a road right next to the shore. We made it in plenty time. Met the cheery chappy at the desk and checked in for the night. Now for my first attempt at erecting the tent! 20 mins or so later, it was up! Woohoo! No problem! Time for a meander around the area, which only has one small hotel/bar/restaurant really and the beach. Went to the bar & had a wee glass of sherry with one of the locals I got chatting with, a little sun kissed after a day of cycling and running off the addrenalin of the day, surprisingly not feeling tired really at all or particularly hungry, but I had been snacking on the way round. The Seal Shore Campsite had a cosy friendly feel to it, facilities were well thought out and in a great location right by the sea, which is exactly where I wanted to be. While I took a wander round to the day room & WiFi area I bumped into some fellow friendly campers who were cooking in the sheltered outdoor area, they kindly offered me a mug of tea, which I really needed as my body temperature had dropped a bit with the sun going down and the earlier cycling addrenalin had worn off. Next I was invited to join them for a beer on the beach by their campfire which they had ingeniously made out of two shopping baskets! Fabulous! Warmth and great company. 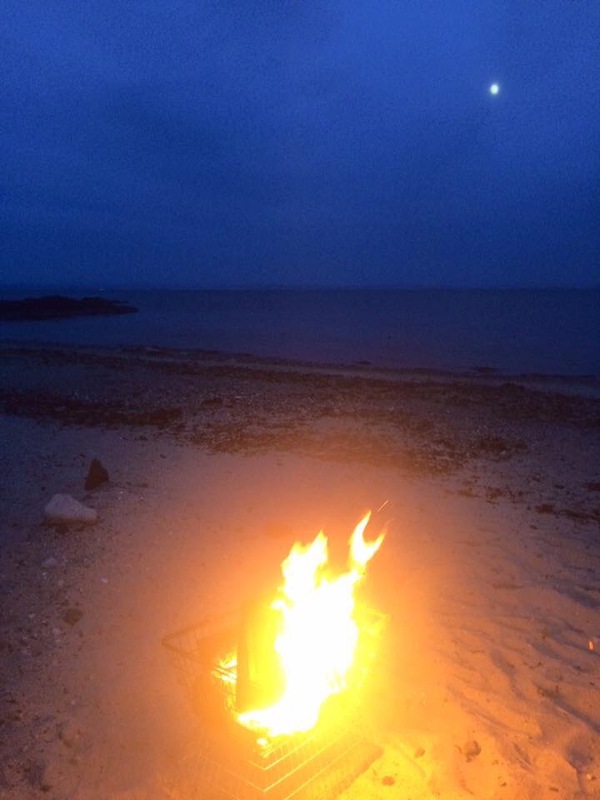 We all exchanged some banter by the moonlight with the waves lapping at the shore till it was time to head to my wee tent and bed down for the night. Maybe it was all the excitement, the energy of the day, I don’t know, but I was pretty wide awake and not finding sleep easy to come by. It wasn’t long before the sun was up so I got up too and went for a walk about, everyone else was still asleep, I pondered how by all accounts I wasn’t! It was dry but there was rain forecast and clouds looming in the distance, so I decided to just quietly take my time, dismantle my lodgings and repack the bike ready for my last leg of the journey back to the ferry port. A couple of hours later the companions I had met by the campfire the night before were getting up, I had hoped to catch them before I left. They assured me that this last section of road was pretty flat and easy! Liars! Lol! This gave me a false sense of security as I left and discovered this was not the case! Then the rain clouds decided to release themselves on me just to add to the challenge but I was thankful at least I’d packed my tent before this deluge! Just as I got round what I thought was the last corner nearing the ferry port, a sign to my dismay pointed uphill AGAIN to the last few miles of my journey. Another slow climb, wet, not completely miserable but definitely tired and really looking forwards to seeing the dock especially since I was cutting it fine on time for departure. Finally, there it was, the ferry, me, the last one on again. This time I stayed dry below deck and sat in one of the comfy lounge chairs where I found myself dozing off for a quick catch up of refreshing winks that had omitted to find me the night before. A short train ride, a couple of miles cycle and I was back home with this adventurous experience under my belt, a challenge met and a sense of satisfaction that I’d managed to accomplish what I’d set out to do. A great memory created and inspiration for more trips in the future or a repeat of this one remixed in some way. This entry was posted on August 5, 2016, 9:36 am and is filed under Bikescapades, Vital Grooves. You can follow any responses to this entry through RSS 2.0. You can leave a response, or trackback from your own site.